One question I often get asked is: How come I get to travel across the world and still get to keep a job? There’s nothing special about me really. I am the same as most young people my age. I work full-time from Monday to Friday, pay my bills, do grocery shopping, study and sometimes have a bit of social life. But I travel – and travel a lot. After my trips, I come back every Monday morning and continue my daily work routine. I read travel blogs and I get inspired by people who have left their jobs and travelled the world. It’s an amazing feat and I want to do that as well someday. Often, there’s this voice saying that I take the same leap, but my practical mind always wins and says that it’s not yet time. Why? There are many reasons and it’s possible that you may have the same hesitations. I’m young and I have just started my career. And perhaps I’m too scared or practical to afford such a big leap. Besides, I enjoy what I do for work and as of now, I have no plans of leaving. I have debts to pay and I think I’m not yet financially stable to take such a leap. So how can you travel and still get to keep your work? First make a choice to actually WANT to travel. They are right. 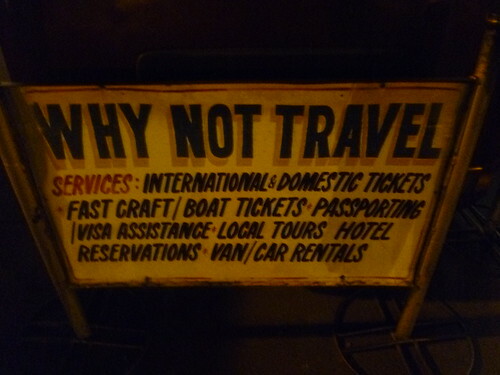 Why not TRAVEL? Every new year, my Facebook feeds contain resolutions from my friends and their desire to travel. Everyone seems to want to travel. But the drive fades out because of work, money or other reasons. And as the year ends, some would sigh and say “Oh, I will make travel happen next year”. BREAK THE CYCLE! Plan ahead and make it happen. Plan in advance when is the best time for you to take a break from work and ask your boss for a vacation leave. Merge it with public holidays to save on your holiday counts. Book a flight (even months in advance), buy a guidebook, research and even book hostels or search for a couchsurfing host. Do everything that will force you to travel. If you can, book trips with friends so you have people to plan a trip with. If you can’t find anyone to go with, go by yourself and make friends when you get abroad. SAVE. Don’t use lack of money as an excuse not to travel. One of the excuses I often hear is that people could not travel because they don’t have the money. You don’t need to be rich to see the world. Money is crucial in our lives but it should not be used as an excuse from achieving our dreams. Control your spending. Do you need the newest iPhone? Think twice. Use these savings to plan a big trip. 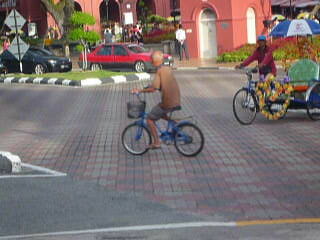 Or if you are really short on cash, travel small and visit a neighbouring country, island, state or city. Arrange if you can ‘work virtually’. Thanks to the conveniences of the Internet, virtual offices are possible. I’ve worked ‘virtually’ for one and a half years in the Philippines. It was a positive experience for me; working away from an ‘office desk’ didn’t have any negative impact on my productivity and output level (I hope so 😉 ). And working abroad means that you have the weekday evenings and the weekend to explore and travel. Changing environments often encourages you to be motivated. 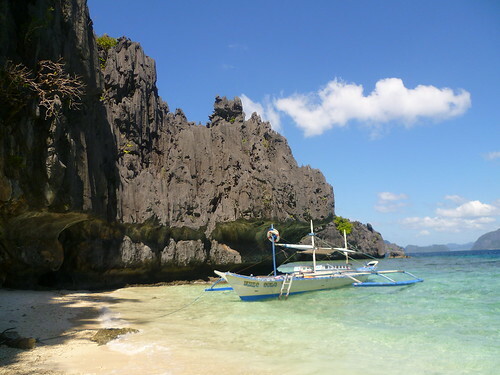 Why sit in front of your boring desk if you can do work in the beaches of El Nido, for example. There is the downside of course that you have to work – but with a view like this, I don’t think you’ll regret it! Ask your boss if you can work for 1-2 weeks virtually, and often if they trust you enough, they would say yes. You can do almost everything virtually – check and answer emails, make phone calls, attend meetings and even do presentations. Travel doesn’t need to take long –do it on weekends. You don’t need to fly 12 hours or take a month-long holiday for it to be considered as ‘travel’. There’s no standard duration nor distance for a trip to be considered well, a trip. For me, the essence of travel is when you take the extra step in order to know and discover a destination regardless of the time spent nor the location. I’m a fan of weekend travels and I’ve done it on several countries in my list. There are times when I think that these days weren’t enough. It’s true – but there’s no stopping you from coming back there again. And finally, if you have an option: WORK ABROAD. Find a job abroad that you like and apply. There are lots of opportunities available for people to work abroad. The salary may not pay well or the position may not be as prominent – but hey, at least you are in a new destination! I’ve done most of my travels in the past four years while having a full-time job. I never stopped from actually having one. And if I add all the travels I’ve done in the past four years, it will equate to almost one year of being on the road (yup, almost equivalent to me travelling for one year around the world). For me, there are no differences whether you travel for one year or one weekend. But I still manage to earn a living, go forward with my career and be happy. There are no secrets really. Happy travels! How do you balance work and travel? Do you have any other tips or advice to share? Feel free to comment below! I agree!, I’am also keen to travel locally and internationally. I’m also a full time employee. But I travel at least once or twice a year. Just like you, we make our travel plans months ahead. We always checked the online ticket if there’s a promo. If there is. We immediately buy our ticket. But we’re always checking the long weekend on the calendar before we booked our flight. You’re right! Just like me, I am not rich, I am just an ordinary employee, but I travel yearly. All I have to do is I bought tickets ahead of time from 3 to 6 months before our travel date. Then I save money for months before our travel date. We also plan our own itinerary. So that our time will not be wasted. I am a virtual employee for my company, and can work from anywhere. I want to take the plunge, sell my “fixed” assets (those that “fix” me into living in one place, lol), travel the country, meet people, find female companionship (and hopefully one that becomes a special travel partner), and see the sites. Cool site I like the banner). Good post and life perspective. I am on a quest doing 80 different jobs around the world and writing about it. There really is no excuse not to follow your heart when it comes to creating the lifestyle you want. I had a problem funding it and finding good resources on real jobs, which is why I stared my site, sick of bogus advice. If you are interested in long-term travel I have found you need a job that you can do in a lot of different locations, so most people might advise teaching english, travel blogging or some other kind of job that makes money online. I have been selling timeshares for the past few months, and you can also do that long term in 100 different countries and it is fairly seasonal, so you could do 4 months in one beautiful spot in high season then go to another for their high season when the season ends. Cool, thanks for the nice comments. Your experience goes to show that travel can coincide with work & doing business. TImeshare is not my thing, but I guess it helps in making some bucks to support your trips! This is a great post. I admire your determination and go to attitude. You go for what you want and everything you’ve said is pretty much you. The only thing that’s stopping you isn’t money or work, it’s just you. Keep up the good work wherever you are! Alexa Meisler recently posted..March 2012: Where is Roland? So true! I always get the comment ‘you’re so lucky to be able to travel so much’, but like you with a full time job and study, it’s not luck! It’s planning, prioritising, and just bloody well DOING IT! Yes, everybody’s pinning it on luck – but it takes lots of sacrifice, planning and actually doing it! Glad that you are on board with me on this one! You make some good points, Jerick – e.g. controlling spending or planning ahead. I’ve never seen work as an obstacle to traveling. I have a full-time job too and joggle it with travel. The key is definitely stretching whatever time off you have by adding a day or two here and there, making travel plans months ahead etc. plus staying healthy – if you don’t need to take sick days off, you’ll end up with more travel days. Good for you. Yes, that’s really my main point why I wrote the article – to show that you can still work full time and enjoy having a travel-filled lifestyle! Man, I totally agree with all of this. Someone needs to organise some kind of movement, to get people to travel more. The world would be a much better place! Nice post Jerick, same as Neil, this topin explains my situation also. I am using my annual vacation leaves in travelling or simply weekend getaway to nearby top destinations. A routinary job should not an excuse for us no to wander. Travelling has no limits or boundaries. Good for you! take advantage of these vacation leaves and actually motivate yourself to travel – you won’t regret it! This post was an awesome read. I travel a lot myself, and everyone just doesn’t seem to understand that once you want something, you try your best to make it happen! Travel is great regardless if it’s for a week, a month or a year! I like your idea about booking flights in advance. I think this is the best option. They’re way cheaper if you book in advance these days and it gives you something to look forward to. I’m terrible at saving so instead of saving cash, I book something like a flight or a hotel as soon as I get paid. That way, you only need your spending money when you leave. I started booking things almost a year in advance when I planned my big trip travelling so my first 3 months on the road were virtually paid before I left. Hey darling!!! great great post! 🙂 Love it!!! Hope you’re enjoying EU! Miss our chats! hope to catch up sometime soon, even virtually? 🙂 Take Care!!!! Thanks Tin! I do enjoy it so far – you should come for a visit! Great post, explains my situation perfectly. I’m lucky that London has so many travel routes, but working the 9-5 I’m still not going to be allowed months off at a time to travel rtw. Thats why in recent year i’ve concentrated my efforts on seeing what Europe has to offer and i’ve loved it. No long flights, but still the same backpacking experiences. Love it! Yes, exactly – same backpacking experience without the hassle of carrying a big backpack. 😛 I’d love to backpack long term someday – but for now, it’s a work-travel life for me. Just wanted to show that it’s possible!